Watch my video first, before you cook it and serve! You gonna IMPRESS your family and friends if you serve how I do. 🙂 I’ve already impress lots of friends and family and know how great that feels! 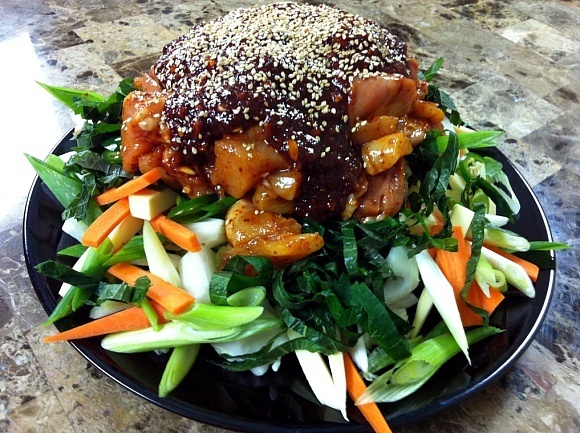 Mix Gochujang and next 7 ingredients in a small mixing bowl and whisk until well combined. If you have time, leave sauce mixture in refrigerator for over night. It will actually getting better and better! Pour 1/4 of sauce into meat and mix it well, set a side while preparing vegetables. Arrange vegetables first on a large serving plate, then add marinated chicken on very top and pour remaining sauce. Add sesame oil and seeds as much as you want right before serving or cooking. From here, you can serve prepared vegetables and meat, and cook on your dinner table as I did on the video. 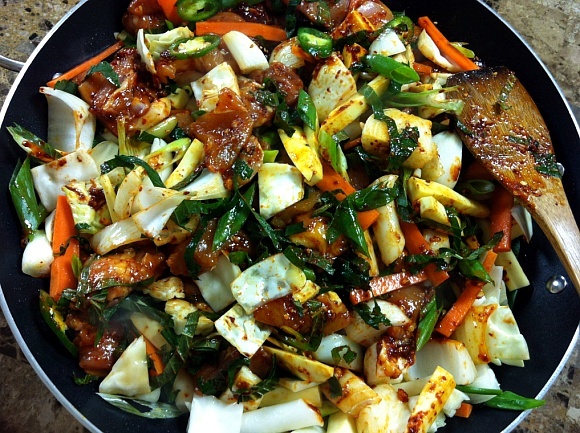 Or you can start cook and then serve completely cooked Dak Galbi. Either way you can follow my delicious cooking directions. Heat a large skillet (I recommend 14 inch), add oil, swirl to coat; add vegetables, chicken and sauce (Everthing!) into hot skillet. Cook 15 to 20 minutes or until chicken cooked through and vegetables are soft. Serve with lettuce, ssamjang (Korean thick, spicy dipping paste), sliced chili peppers and garlic to wrap all food together. If you have a little leftover sauce and vegetables on the skillet, don’t wash it out! Turn the heat back on, add fried rice ingredients to skillet and mix with all the leftover sauce! It will be the best fried rice you’ve ever had! 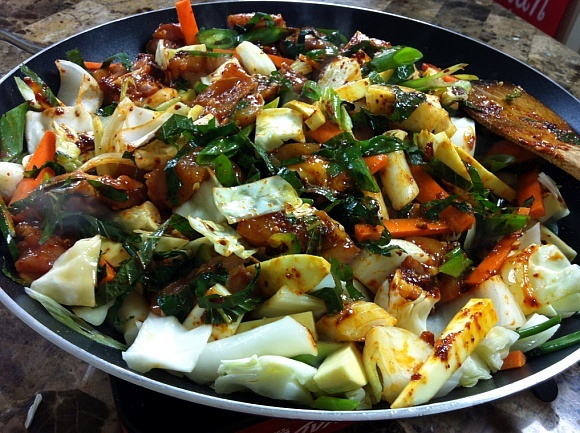 I hope you enjoy my Dak Galbi recipe as much as we did! Ah, it was to die for!!!!! I really wanna try this recipe. Looks sooo yummy. But I noticed that this recipe and the dak galbi from Aug 17 is a little different so I’m a lil confused which to use. Try this recipe not the Aug 17. The post Aug 17, the recipe wasn’t perfected. I posted the first recipe because it turned out very good, but I knew I could make it better. This recipe is the final one.